In the first article of this two-part series, I showed paintings from the first part of the career of Sir George Clausen (1852–1944), tracing the development of his style to that of Impressionism in the 1890s. Although he had been a founder-member of the New English Art Club, with the aim of reforming the Royal Academy of Arts, he had continued to exhibit at the Academy, and in 1895 was elected an Associate. 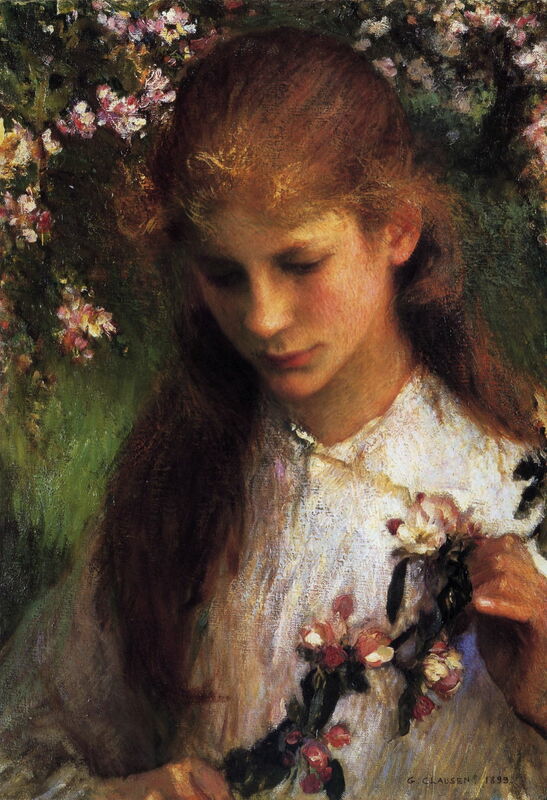 Sir George Clausen (1852–1944), Apple Blossom (1899), oil on canvas, dimensions not known, Private collection (stolen 2009, recovered 2015). Wikimedia Commons. Although still an Associate, Clausen had become so prominent in the Royal Academy that he was appointed its Professor of Painting in 1904, a post which he held for two years, until he was finally elected a full Academician. He continued to live at Widdington in Essex until 1905. 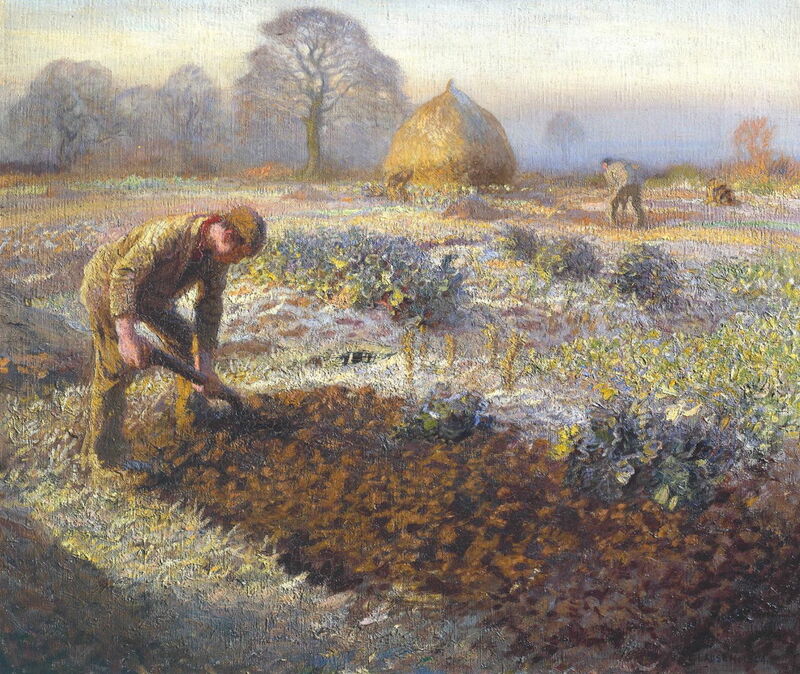 Over this period he painted some of his finest works, including A Frosty March Morning (1904), which is sometimes known as The Allotment Garden, Winter. It shows influence from Pissarro’s paintings of early winter morning frost and mist, but its style is distinctively Clausen’s. He also came to excel in capturing light and movement. 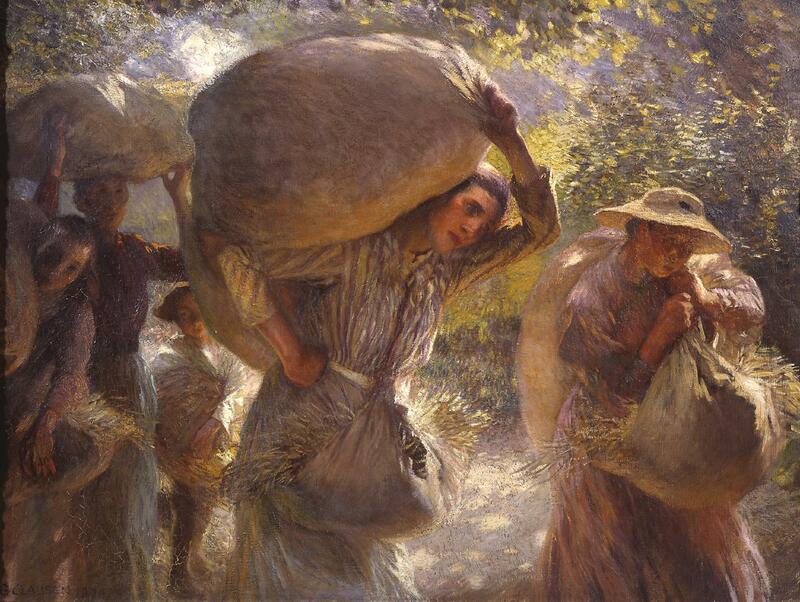 In his Gleaners Coming Home (1904), swirling brushstrokes make the gleaners’ clothes appear to move as they walk home in the evening sunlight. Gleaners were still commonplace in the Essex grain fields at harvest time, trying to scrape enough waste grain from the ground to feed their families. 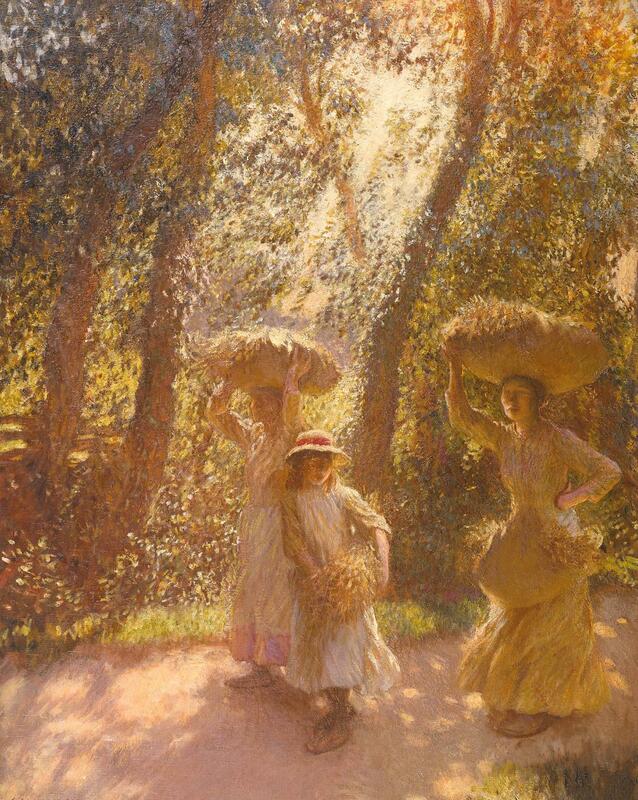 The Gleaners Returning (1908) is a marvellous contre-jour (into the light) view, again with swirling brushstrokes imparting movement in the women’s clothes. Clausen was too old for military service during the First World War, but in 1917 he was appointed an official war artist, and assigned to Woolwich Arsenal in London. After the war, his landscape painting concentrated around his country cottage at Duton Hill, near Dunmow in Essex. Although termed a ‘hill’, Essex is so flat that anywhere else, this minor hillock would have passed unnoticed. 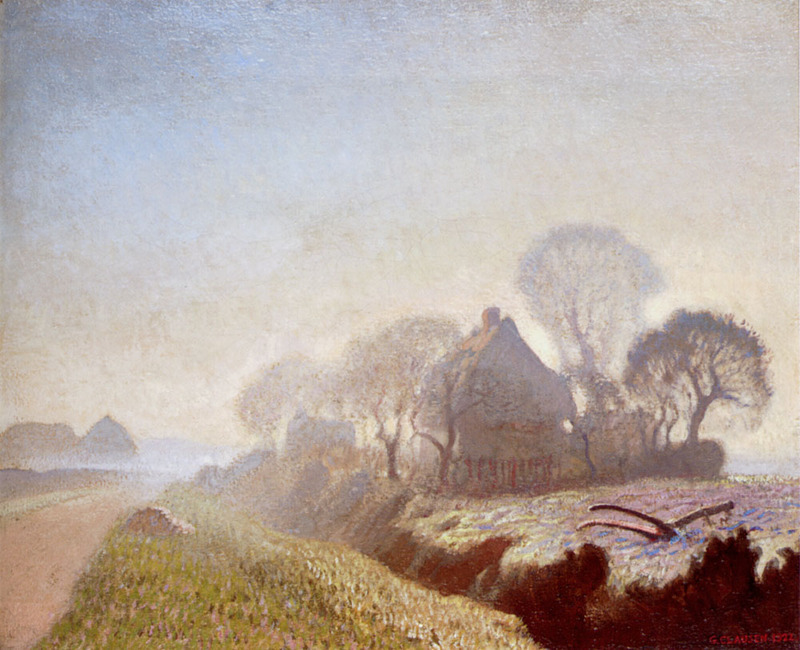 Sir George Clausen (1852–1944), Morning in November (1922), oil on canvas, dimensions not known, Private collection. Wikimedia Commons. His depiction of the cold and mist of a Morning in November (1922) again looks back to Pissarro, but in his distinctive Post-Impressionist style. 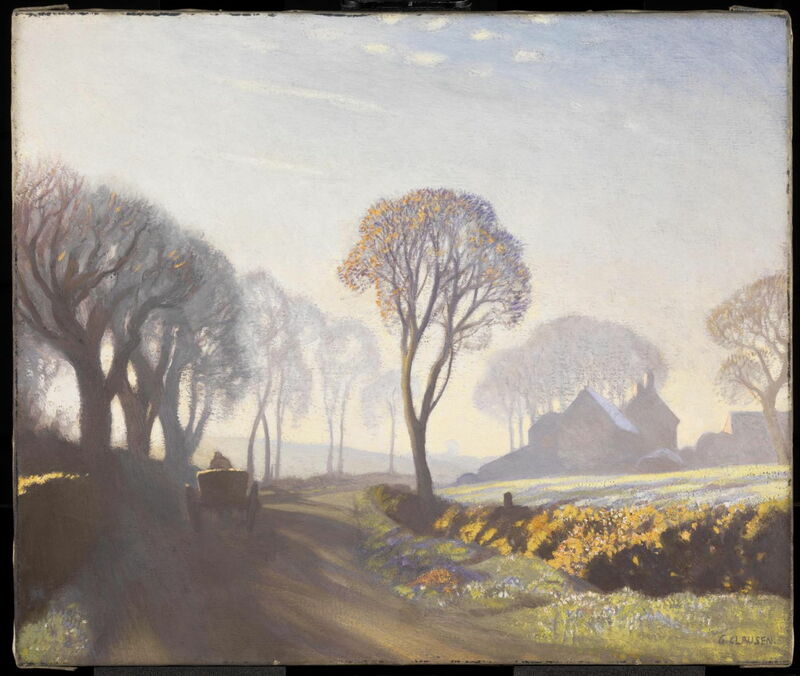 The Road, Winter Morning (1923) shows Barnard’s Farm, opposite Hillside, at Duton Hill. Its mist and morning sunlight bring more subtle colour, a marked contrast to his Impressionist paintings of twenty years earlier. His work during the war had been well-received, and in the 1920s he was also invited to paint several murals, including one celebrating Wycliffe’s English Bible for the Palace of Westminster (the Houses of Parliament), London, in 1926. He was rewarded with his knighthood when it was completed. He continued to paint and exhibit at the Royal Academy through the 1930s, when he moved from Duton Hill and spent most of his time at his house in St John’s Wood, in the London suburbs. 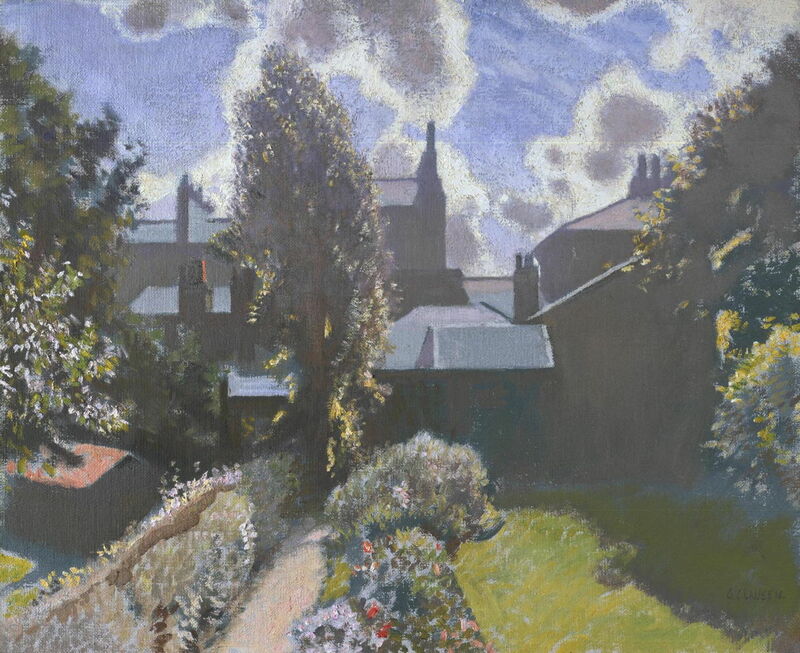 My Back Garden (1940) was painted when he was well into his eighties, an impressive contre-jour view of the London suburb. I hope that this small selection of Clausen’s wonderful paintings has shown how one artist, at least, was still moving on from the changes wrought by Impressionism, but not abandoning the centuries of development which had preceded. Inevitably, his work suffered at the hands of the critics, and even now there are those who rate him somewhere below the likes of Sisley. As a result, although several of these paintings are in major collections, most notably that of the Tate Gallery in London, they are seldom celebrated, and all but ignored in the literature. Perhaps in the fullness of time, when the ephemeral gimmicks of so much of the twentieth century are mercifully forgotten, their longer-term importance to painting will be recognised. Posted in General, Painting and tagged Clausen, Impressionism, landscape, painting, Pissarro, Post-impressionism. Bookmark the permalink. Nice post. His work is so beautiful. Pity the Tate hardly ever puts them out and when they do they are so high up the wall you can barely see them. Thank you. I have some sympathy with the Tate, as they have a lot more art than they ever have space for. And at least they are progressively making most of it available online under reasonable licence terms now, too. But yes, it would be so much better if they could be seen in real life.